Thanks to a fun-to-drive nature, the 2016 Kia Sportage is an entertaining alternative to other small crossover SUVs on the market. 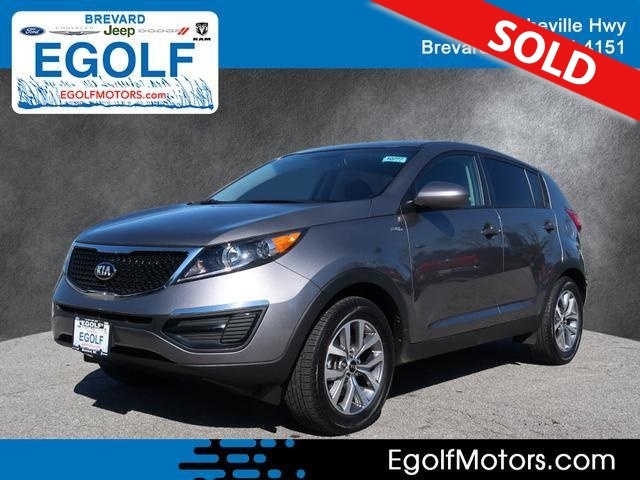 The 2016 Sportage receives a few minor equipment changes, including a touchscreen display with a rearview camera for the LX trim's Popular package, and standard leather upholstery for both the EX and SX trims. A few of the EX's formerly standard features have been made optional (including the Infinity stereo). The SX loses its xenon headlights but comes standard with the previously optional panoramic sunroof and ventilated front seats. Eye-catching styling; powerful turbo engine in the SX trim; sporty handling; good value; generous warranty. Kia often imbues its vehicles with a sporty vibe, and that's certainly apparent with the aptly named 2016 Kia Sportage. Throughout the production of this current generation, the Sportage has delivered both nimble handling and strong performance. The turbocharged power plant in the Sportage SX is the standout, with 260 horsepower and 269 pound-feet of torque. In addition, the 2016 Kia Sportage boasts a window sticker often lower than its more established competition. Sharp styling and an available turbocharged engine are part of the 2016 Kia Sportage SX's appeal. That said, not all is rosy, especially for those wanting a family-friendly activity vehicle. The aggressive styling comes at the expense of both passenger room and cargo space; cargo volume with the rear seat up or down is roughly equivalent to Honda's smaller HR-V, for instance. And the same suspension tuning that contributes to the Sportage's agile feel creates a ride quality possibly too firm for some backsides. Finally, fuel economy for both powertrains is underwhelming. If you prefer more utility with your sport, both the Honda CR-V and Toyota RAV4 provide a bigger bang for the consumer buck. And if you like the Sportage's high style but demand more room, the newly updated Hyundai Tucson is worth checking out. Finally, if you're seeking a sporty demeanor balanced with utility, the Ford Escape and Mazda CX-5 represent perhaps the best balance of those two attributes. But if you actually like small and sporty for your compact crossover SUV, the Sportage, especially in SX trim, should make you very happy. The 2016 Kia Sportage is a small crossover SUV with seating for five passengers. It's offered in three trim levels: LX, EX and SX. The LX includes 17-inch alloy wheels, rear privacy glass, air-conditioning, cloth upholstery, a height-adjustable driver seat, 60/40-split folding and reclining rear seats, a tilt-and-telescoping steering wheel, full power accessories, cruise control, Bluetooth phone and audio connectivity and a six-speaker sound system with a CD player, satellite radio, an auxiliary audio input jack and a USB port. An optional Popular package for the LX adds a rear spoiler, roof rails, a trip computer, a 4.3-inch touchscreen audio system, a rearview camera, illuminated vanity mirrors and a rear seat center armrest. The Sportage EX starts with all of the above and adds 18-inch alloy wheels, chrome exterior trim, keyless entry and ignition, dual-zone automatic climate control, leather upholstery, a six-way power driver seat (with adjustable lumbar support), heated front seats, a leather-wrapped steering wheel and Kia's Uvo telematics system. Adding the EX Premium package gets you foglights, heated power-folding mirrors, a panoramic sunroof, rear parking sensors, a cooled glovebox, ventilated front seats, an auto-dimming rearview mirror, a 7-inch touchscreen display with voice controls, a navigation system and an upgraded Infinity sound system with HD radio. The sportier SX model includes those items and adds different 18-inch wheels, a turbocharged engine, a unique front grille, LED daytime running lights and taillights, dual exhaust outlets, a panoramic sunroof and aluminum scuff plates. The 2016 Kia Sportage is available with two different four-cylinder engines. The LX and EX models come with a 2.4-liter version that produces 182 hp and 177 lb-ft of torque. The SX model gets a more powerful turbocharged 2.0-liter engine that cranks out 260 hp and 269 lb-ft. Both engines come paired with a six-speed automatic. Front-wheel drive is standard, with all-wheel drive available as an option. In our testing, the 2016 Kia Sportage has proven to be one of the quickest vehicles in its class. In Edmunds testing, a front-drive Sportage SX sprinted from zero to 60 mph in a quick 6.5 seconds, while an SX with all-wheel drive needed 7.3 seconds. EPA fuel economy estimates for the front-drive LX and EX are 24 mpg combined (21 city/28 highway). The all-wheel-drive LX and EX drop to 22 mpg combined (19 city/26 highway). The SX is only slightly less efficient at 22 mpg combined (20 city/26 highway) with front-wheel drive and 21 mpg combined (19 city/25 highway) with all-wheel drive. Standard safety features on all 2016 Kia Sportage models include antilock disc brakes, traction control and stability control, front-seat side airbags, full-length side curtain airbags and active front head restraints. Kia's Uvo telematics system, which is standard on the EX and LX trims, includes emergency and roadside assistance, stolen vehicle tracking, geo-fencing and speed tracking (allowing parents to set limits for teen drivers) and other smartphone-enabled features accessible via the Uvo app. In Edmunds brake testing, a Sportage EX came to a stop from 60 mph in 120 feet -- a couple feet shorter than average for this type of vehicle. A front-wheel-drive SX did even better at 117 feet, while an all-wheel-drive SX needed 120 feet. In government crash tests, the all-wheel-drive Sportage earned a top overall rating of five stars, including five-star ratings for both frontal-impact and side-impact protection. The front-drive Sportage received a four-star overall rating, but still managed to earn five stars in both frontal- and side-impact testing. In Insurance Institute for Highway Safety crash testing, the Sportage received the highest rating of "Good" in the moderate-overlap frontal-offset, side-impact and roof-strength tests. Its head restraints and seats also earned a "Good" rating for whiplash protection in rear impacts. In the small-overlap frontal-offset crash test, however, the Sportage received the lowest score of "Poor." The interior of the 2016 Kia Sportage is a handsome space with styling that gives it a bolder look than more traditional competitors. Gauges, knobs, buttons and other controls are thoughtfully laid out and easy to use, especially the navigation functions accessed via the 7-inch touchscreen. The main aesthetic downside here -- the extensive use of hard plastic throughout the cabin -- is partially offset by the fact that it's nicely textured and accented by well-placed padding in useful places, such as the armrest atop the center console. Interior materials are generally hard to the touch, but the control layout is attractive and thoughtfully designed. The front seats offer good comfort and support, but the three-place rear bench is a different story. Legroom is in short supply in the second row and, though the reclining seatbacks are a plus, it would be nice to be able to slide the bench seat forward and back like those in competitive models. Cargo space also is in comparatively short supply, with 26.1 cubic feet behind the 60/40-split folding rear seats and 54.6 cubic feet with both of those sections folded down. On the bright side, the divided organizer beneath the cargo floor is good for storing odds and ends like a first aid kit. Nonetheless, the Sportage remains one of the least capacious crossovers in its class. The 2016 Kia Sportage has a pretty responsive and fun-to-drive character, and credit for this lively feel goes to a suspension that's tuned to favor sharper handling. The trade-off, though, is a ride quality that some buyers may find a little too harsh for their taste. You won't go wrong with either engine. The standard 2.4-liter engine that powers LX and EX models has enough power for daily driving and highway passing. But it might be hard to resist the charms of the SX, as its 260-hp turbocharged mill delivers impressively quick acceleration.